I use Airfoil to make it easier to sound from any audio source on my Mac to as many speakers as I want (something you can only do normally in iTunes), but I’ve noticed the sound dropping out frequently since updating to OS X 10.9. Rogue Amoeba’s release notes don’t hold any clues besides the fact that Airfoil is not yet Mavericks-compatible, but I realized that the sound seemed to resume whenever I would switch back to Airfoil to see what the problem was. Enter App Nap. Of course Mavericks has a marquee feature that explains just this behavior. App Nap “pauses” apps that it thinks are running in the background and needlessly taking up resources. 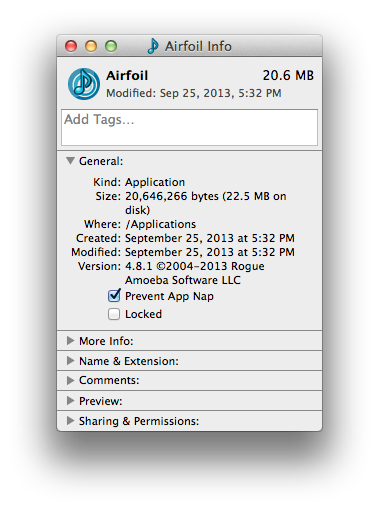 A quick search lead me to an easy way to prevent OS X from putting a specific app to sleep. That seems to have prevented the sound from cutting out for me.